WIRL Project | Too Many Choices! Over the last year my wife and I have attempted to emphasize the importance of making good choices with our toddler. It has been an extremely daunting task to not only teach him what a choice is, but help guide him toward decision making that we find acceptable. We both feel that the quickest way for him to learn is to have a high level of autonomy over minor situations so that he can practice the skill while we still make most of the major decisions for him controlling and modeling proper behavior. So far we have seen vast improvements in his understanding of choice, but like most children this age it is a test of wills between parent and child. So much of our lives are driven by choices. We make thousands of them each day. Even as an adult I find myself struggling with the ability to choose especially in a culture that now seems to demand entitlements of individualization and variety. Our culture seems to have shifted from a nation who wants this and that to a nation of this and this. Personalizing options are meant to help one feel in control, satisfied and fulfilled. These popular trends produce high pressure to keep up with demand. How then, can I find the freedom to choose to feel so restricting? 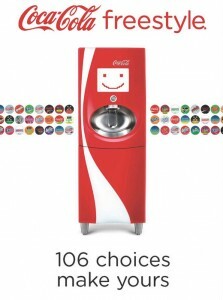 I get a restrictive, suffocating feeling when I am at Zaxby’s in front of a Coke Freestyle machine. If you have never seen one of these it is a touch-screen automated fountain machine that boasts over 100+ Coca-Cola brand selections. During each visit, in what feels like an excruciating eternity, I will eventually settle on a drink selection after flipping through the entire catalogue several times. This greatly frustrates my accompanying dining party as I am either made fun relentlessly of or told to get out of the way. This may seem funny to you that such an inconsequential decision would be so difficult to make, but for me taking a leap toward the perfect selection from a huge assortment is virtually paralyzing. Too many choices are distracting. Our good choices routine with our son backfires when we allow him to choose an episode of one of his favorite television shows to watch before going to bed. In addition to his decision making development he has also (finally) developed a diverse TV palette beyond Mickey Mouse Clubhouse. He has learned the evil powers of the TV remote and the on-demand capabilities of the DVR. His frequent back-and-forth waffling on what to watch often leads to an unwanted outburst that inevitably delays bedtime. Much like his father in standing front of the Coke Freestyle machine, my son is distracted by too many choices. Some of the biggest fights between my wife and I have not been over money, household chores or child care responsibilities. A number of these conflicts have been over where to go to dinner/get take-out or what movie we want to watch on Netflix. It’s not every day we eat out or take a few hours to relax in front of the TV. We both try way too hard to choose the perfect selection to make it worth our while. Flipping through local restaurants on Google Maps and movies on the Netflix genre guide are eerily similar to the previous dilemma I described with the Zaxby’s Coke machine. Too many choices! I remember as a kid before satellite television we got the four local major network stations (six channels on a clear weather day!) from our roof-top antenna. Show listings were published in a paper TV Guide that came out weekly in the Sunday newspaper. If you missed an episode of your favorite sitcom you would not be able to watch it until it re-aired during the show’s off-season. In addition, growing up in a small town we had very little selection when it came to dining out. The nearest trendy eateries were a 30 mile drive away. My father was never convinced any meal was worth that far of a drive. Back then food and entertainment selections were made easy due to a lack of choice. Ahh, the good old days. The next time you become frozen in the cereal aisle at the supermarket or break into a cold sweat when flipping through your satellite radio just remember that large selections are intended to make choices easier, not harder. I will try to keep telling myself that the next time I am in front of the Coke Freestyle machine…and I will continue to stand their motionless.